The Fool Says . . .
One of the really remarkable things about the Soviet cult of Vladimir Lenin was its religious character. It is a reminder that strict atheism is rare, even in the modern world. There is a Psalm verse that speaks of how unusual and even ridiculous atheism is: “The fool says in his heart, there is no god” (Psalm 14:1). The Communists were adherents to the philosophy of Karl Marx and therefore strict atheists. They were convinced religion is an “opiate of the masses” imposed by class oppressors upon the workers and that there is in reality no god whatsoever. The Soviet Union was the first government in world history that committed itself to atheism. And yet, it was also the first government in history to invent a new culture, or system of beliefs and values, that was pseudo-religious. This can be seen in several features of the Lenin cult. 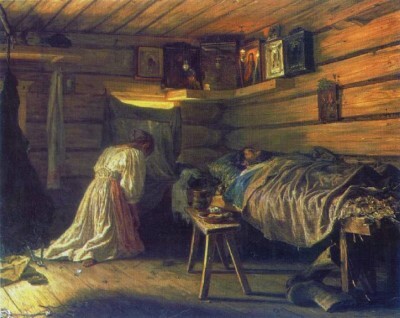 First, the cult of Lenin reestablished in secular form the traditional Christian practice of venerating the relics, or bodily remains, of departed saints. 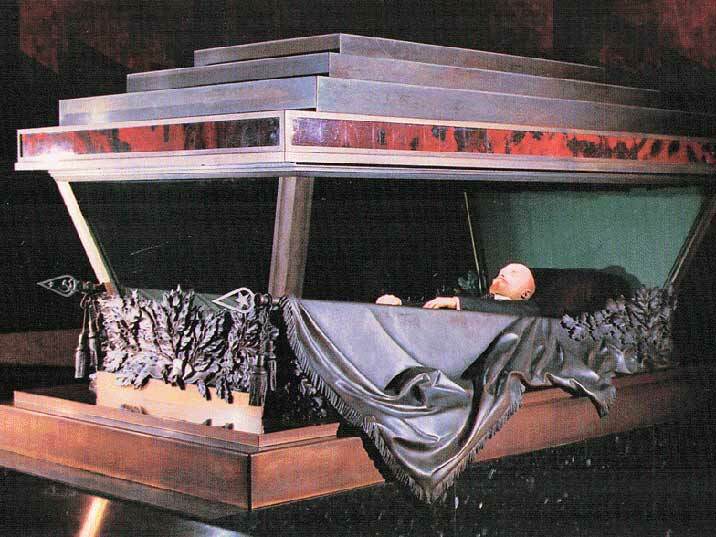 This was the principal feature of Lenin’s Tomb, built on Red Square in the center of the capital city of Moscow. It was therefore quite different from the obelisk erected to commemorate George Washington in the United States capital. The cult of Washington limited itself to the memory of a great statesman (and his political ideals). The cult of Lenin suggested that the statesman in question was a living presence, mystically united to those who pay homage to his physical remains. Second, the cult of Lenin revealed a religious character in its effort to appropriate and “infiltrate” traditional Christian holidays. There was, of course, the annual celebration of Lenin’s birthday (April 22), which can be compared to the way Americans celebrate the birth of Washington each year (February 15, also known in more recent history as President’s Day). But for its part, the cult of Lenin was bold enough to take on even one of the most hallowed festivals of Christianity, Christmas. There is a striking scene in Sofia Petrovna, the short novel written about the Great Terror by one of its victims, Lidia Chukovskaya (I have assigned it before in courses I’ve taught and it always fascinates readers), in which the a family gathers around a “new year’s tree” to place ornaments bearing the image of Lenin on it. The effort of the Soviet government to redirect winter celebrations toward the calendar New Year and away from the birth of Christ was a larger effort at instilling devotion to Lenin and the system he created. Painting of an icon corner before the revolution. 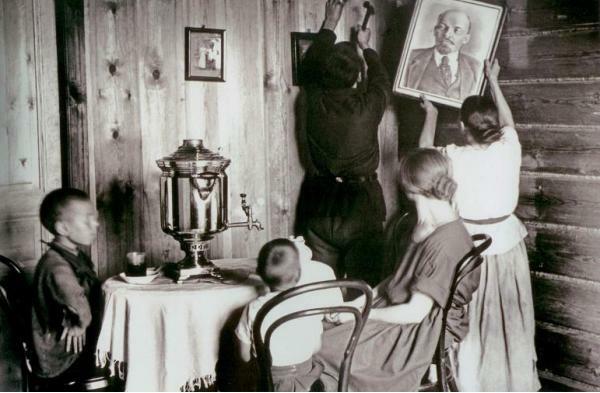 Finally, the religious character of the cult of Lenin can be seen in the stunningly unselfconscious efforts by some to place images of Lenin in their homes the way Orthodox Christians had placed icons of Christ and his saints in homes throughout the history of Russian Christendom. The icon corner, often known simply as the “beautiful corner,” was naturally abolished in all public buildings, but also in the homes of converts to the new religion of Communism. Now, peasants and other commoners would place in the corner of their dwellings the ultimate anti-Christian icon, an image of the atheistic founder of Communism. The fool says there is no god. But Lenin’s followers were no fools. They knew that the utopia of post-Christian Christendom could not be built without at least a false god.